High Quality Content by WIKIPEDIA articles! 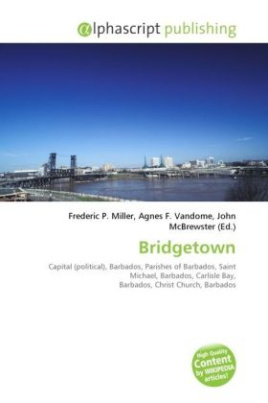 The city of Bridgetown, metropolitan pop 96,578 (2006), is the capital and largest city of the nation of Barbados. Formerly, the Town of Saint Michael the Greater Bridgetown area is located within the parish of Saint Michael. Locally Bridgetown is sometimes referred to as "The City", but the most common reference is simply "Town". The Bridgetown port is located at 13°7 N 59°37 W / 13.117°N 59.617°W / 13.117; -59.617 (Bridgetown port), on the southwestern coast of the island along Carlisle Bay. Parts of the Greater Bridgetown area lie along the borders of the neighbouring parishes Christ Church and St. James. The present day location of the city was established by the British in 1628 following their settlement at James Town. Bridgetown is a major West Indies tourist destination, and the city acts as an important financial, informatics and convention centre in the Caribbean region.